If the security deposit is not managed within 7 days of a reservation being checked back in, the entire amount will be automatically refunded to the customer. Once a security deposit is managed, no further changes can be made on that specific charge. You'll need to refund from the Reservation Charges. The security deposit may only be charged once. Navigate to the Reservation in question - it should be returned. 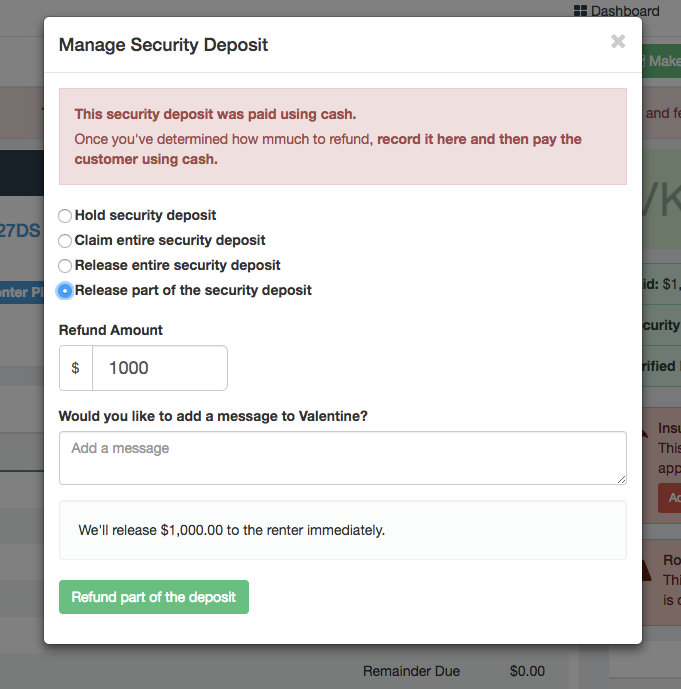 Click on the red "Manage Security Deposit"
Hold Security Deposit: This prevents the system from automatically refunding the deposit after 7 days. Use this if you need to investigate further to determine how much, if any, of the deposit should be withheld, but you need longer than the 7 days. Release Part of the Security Deposit: Allows you to return part of the deposit, a box will appear for you to enter the desired refund amount.